RegSys EN-100-CN – this is dual-direction people counting system which has a possibility of statistics data transferring through LAN, without connecting to a computer. 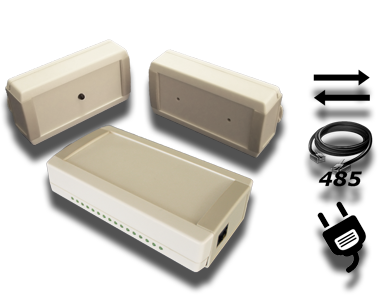 Exchange of information between the sensors and the base station is performed via RS-485. For data link used wire twisted pair (UTP-5). Communication line connected to the RJ-45 connectors on the receiver transmitter and base station. Feeding the whole system is carried out by an external power supply DC with 12-24 V voltage. Statistics are stored in a central database MySQL server. Statistics data transferring to the database is made via LAN. Further analysis and data processing proceeded by a dedicated website. The base station – serves as the collection of data on visitor statistics from sensors connected to it and transmit the data directly into the central database. 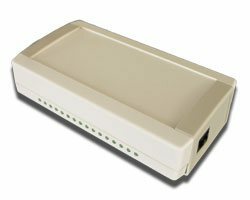 In case when there is no connection with data-base, base station can store statistics data in nonvolatile memory and send them when connection resumes. 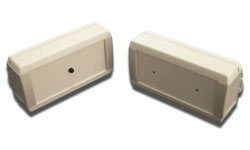 Horizontal infrared sensors mounted on the entrance and / or exit of trading object. Sensors are ergonomically designed and provide a high level of reliability of the information. Statistics data transferring periodicity from sensors to the base station is less than 20 sec., which minimizes the possibility of information loss in case of sudden power outage.